When it's time to plan a graduation party for that high school or college graduate, what do you need to know to make this party a success? What kind of party does the graduate want? Would she prefer an intimate gathering, a party complete with food and entertainment, or a joint party with other graduates? Once you know what she has in mind, you can really begin planning. When should the party be held? For some, a graduation party should begin soon after the graduation ceremony is over. 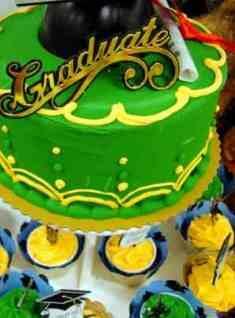 For others, the celebration might be held in the week before or after the graduation has occurred. When you hold the celebration may also help you decide where to host the event. Where will you have the party? Will an open house work for the graduate, or would he prefer an outdoor event at a local park? Can you reserve a local hall or recreation center, or will the fellowship hall or basement of a local church be appropriate? Again, once you've answered these questions, you can move on to other aspects as you plan a graduation party. What food will be served? If the event revolves around a sit-down dinner, you'll need to plan a full course menu. However, finger foods and hors d'oeuvres are usually quite suitable for a large or small gathering. Don't forget to figure in drinks, especially alcoholic beverages, as you work out the party planning list and budget. When planning your college or high school graduation party, the first thing you need to decide is which type of party you and your graduate want to have. Joint celebrations often require a little extra planning. Since graduation parties can be expensive, many graduates often choose to combine their celebrations into one big party. They do so for a variety of reasons. A joint celebration held together on the same date allows a group of friends to honor each other and celebrate their achievements at the same time. In addition, combining several parties into one will typically save money for everyone involved. Graduates can split the cost of the party's location rental (if there is one), the cost of food, and the cost of entertainment if that applies as well. One deterrent to hosting a joint party is how well the guests of honor get along. Trying to please everyone with menu choices, party times and locations, decorations and more can be tricky if several strong personalities are involved. Don't feel like you have to take the traditional route when planning the party. In fact, your graduate may love to see a more unique spin placed on his orher party. Bonfires, beach parties, riverside picnics and other out-of-the-ordinary ideas can turn a humdrum gala into a smashing good time! Create your own entertainment by hosting a karaoke contest at the party. Guests take turns signing their favorite tunes, while others vote for their best (and worst) singers. When the competition is over, keep spinning the music and make room on the dance floor for everyone to get their groove on! Create your own invitations and decorations, and set up a Facebook page with all the info guests will need to know for the celebration. Simple decorations could include balloons and flowers. Purchase paper tablecloths, and ask all the party guests to write their best wishes for the guest (or guests) of honor. Finally, make a party checklist of everything you need to include in the party plans several weeks in advance. Create headings in the list, such as location, time, menu, budget, guest list, entertainment, etc. to help you stay organized. Planning a graduation party does take work, but with some commonsense and organization, your party will be a celebration to be remembered!